90210: the famous zip code that needs no introduction. Fast cars, designer boutiques, Real Housewives, mansions on tree-lined streets...yes, nothing says lifestyles of the rich and famous more than Beverly Hills! This luxurious destination offers a welcome reprieve from the gritty urban sprawl that encompasses much of Los Angeles. And whilst the majority of us can only dream of living the BH lifestyle on a daily basis, there are plenty of ways to live the high-life, if only for a day or two! Rodeo Drive: Spread over three blocks in the heart of Beverly Hills, Rodeo Drive is the epicentre of fashion, lifestyle and luxury. 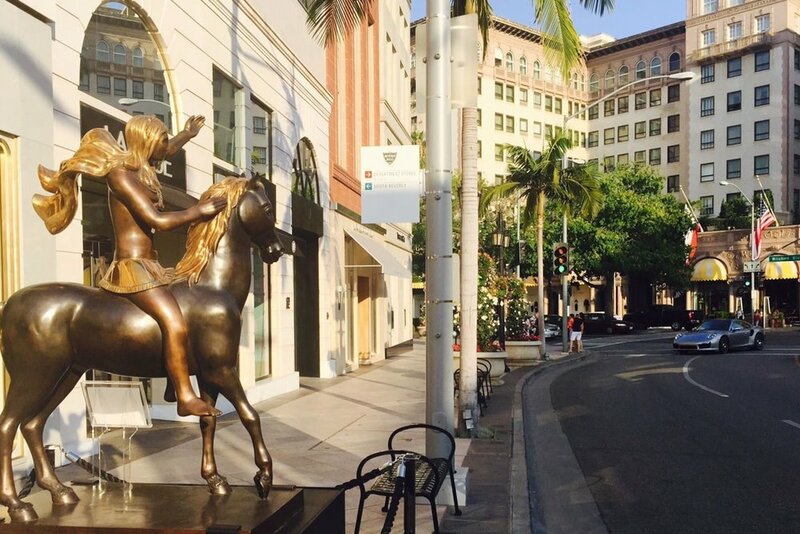 You simply cannot come to Beverly Hills and not pay a visit to the famous Rodeo Drive! Whether you window-shop your way down the palm-tree lined street or grab a seat at a cafe to people-watch, it's a great way to spend an afternoon. G'Day Girl tip - if visiting by car, you'll find plenty of free parking within the City of Beverly Hills. Head to the Via Rodeo carpark facility located at Rodeo Drive and Wilshire Boulevard for 2 hours free valet parking. Via Rodeo: For the perfect picturesque backdrop to any tourist photos, head straight to Via Rodeo. Located near the corner of Rodeo Drive and Wilshire Boulevard this paved European-styled shopping mall looks like it's been lifted straight out of a movie. You'll also find the famous Rodeo street sign on the corner of Rodeo Drive and Via Rodeo. Beverly Hills Farmers' Market: No, that isn't a typo...there is an actual farmers' market held in the heart of Beverly Hills. Who would've thought?! The Beverly Hills Farmers' Market takes place every Sunday along the 9300 block of Civic Center Drive between Third Street and Santa Monica, and is open from 9:00 a.m. to 1:00 p.m. It's also the perfect place to spot a celebrity or two in their natural habitat. On my recent visit to the Beverly Hills Farmers' Market, I spotted fashion stylist to the stars Rachel Zoe with family in tow. Beverly Hills Sign: Nestled in the beautiful Beverly Gardens Park, the Beverly Hills Sign is one of the most photographed locations in the whole of Los Angeles and as cliched as it might be, it should definitely be on your to-do list. Be forewarned though - you will probably be one of 287 tourists there at any given time trying to take the perfect photograph: but that also means there's no shortage of other people to take your photo if you happen to be travelling solo! After your photo session in front of the Beverly Hills Sign, take a stroll around the surrounding streets of the Beverly Hills flats to get a glimpse of some of the gorgeous houses. Greystone Mansion: Owned by the City of Beverly Hills, Greystone Mansion and Gardens comprises a Tudor Revival mansion and sprawling formal English garden. It's been a filming location for countless Hollywood films and television shows and it's easy to see why. Want to know the best bit? It's free to visit and wander around the gardens, which by the way, are the perfect place for an impromptu photo shoot! The Grove: OK, so technically The Grove isn't located in Beverly Hills, but it's only a short car trip away and is a wonderful place to visit on a sunny LA day (which is just about everyday!). Featuring retailers such as Nordstrom, Sephora, Michael Kors and more, The Grove is a high-end outdoor shopping mall. There's plenty of places to eat, drink, shop and relax...you can even hop aboard the trolley car for a quick tour of the complex! Did I mention that there's also a farmers' market? The Beverly Hills Hotel: Affectionately known as the 'Pink Palace', The Beverly Hills Hotel harks back to Hollywood's glamorous Golden Age. This place has been a celebrity hotspot since opening its doors back in 1912 and oozes charm and history. Pull up a seat overlooking the pool at the Cabana Cafe for breakfast or lunch, then wander through 12 acres of lush tropical landscaping to fully immerse yourself in this stunning property. Beverly Wilshire Hotel: If you've seen the movie 'Pretty Woman', then the Beverly Wilshire Hotel needs no introduction! Serving as one of the main filming locations for the movie, the Beverly Wilshire Hotel is the perfect place to brunch with your girlfriends, followed by a Pretty Woman inspired shopping trip along Rodeo Drive. Source: Lisa Raciti // Brunching at the Beverly Wilshire Hotel. Source: Lisa Raciti // The Beverly Wilshire Hotel lobby. Airbnb: Yes, there's no shortage of 5 star hotels in Beverly Hills to choose from, but what better way to get the full BH experience, than by living like a local...literally. Airbnb is a treasure trove of accomodation listings featuring everything from studio and 1 bedroom apartments to private rooms within mansions or even full houses! Best of all it's a more affordable option than most hotels, especially if you're travelling with family or a large group of people. Have you visited Beverly Hills? What are some of your favourite places to visit and things to do? Let us know in the comments below!